If you’ve cultivated a prodigious pumpkin, a hefty Hubbard, or an ample acorn, you should enter it in Southside’s 3rd annual Biggest Squash contest! The event will take place this Saturday, October 30th, at 10 a.m. at the Broad Street farmer’s market (located at 807 Broad St. near Potters Ave). First- and second-place winners will receive Stop & Shop gift cards, but everyone who comes for the contest will be able to enjoy free apple cider and Allie’s famous donuts. It’s the final day for the market this year, and tables will be bursting with fall produce, so don’t miss this chance to show off your colossal calabazas and your not-so-teeny zucchini to earn the respect—or even the pity—of your fellow growers! We wanted to share with you all this reflection from our good friends and chef partners Matt and Kate Jennings, who run Farmstead Inc., a neighborhood artisanal cheese shop in Wayland Square here in Providence. They also own the bistro next door, La Laiterie, which features local, handmade, and seasonal cuisine inspired by their travels abroad. The Jennings clearly have a passion for food that nourishes both the body and the spirit, and that is especially apparent in the message from their latest newsletter. We think it expresses very well how we as a culture came to lose our connection to the food we eat—and how we are now, hopefully, finding our way back. Click below to read their thoughtful essay. The commemorative menu designed by RISD instructor William Hall. Johnnie Chace, an SCLT board member and Providence-area developer, will be hosting President Obama this evening at her home for a political fundraiser. Thanks to her efforts, the gourmet dinner will feature a wide variety of locally-grown produce and artisanal foods from throughout Rhode Island, serving as an edible exhibit of the state’s culinary skills and traditions. We’re proud to say that all of the herbs, onions, carrots, and leeks going into tonight’s menu came from the Little City Grower’s Co-op, which includes City Farm! Read more about preparations for the meal in this story from The Providence Journal. Vote for Southside this fall! It’s election season again! No, we’re not talking about the November mid-terms, although those are of course important and deserve your vote as well. We’re talking about Edible Communities’ fifth annual Local Heroes Awards, which honor great people and organizations who sustain thriving local food cultures across the country. Edible Rhody is seeking readers’ choice nominations right now for best chef/restaurant, best food artisan, best beverage artisan, best farm/farmer, and best non-profit organization in the state. We’d love to be considered under that last category and be featured in the magazine when they announce the winners in the spring of 2011—just in time to celebrate our 30th anniversary! If you’d like to put our name forward in recognition of our three decades of work creating community gardens and teaching people to grow their own food in Providence, please go to www.ediblecommunities.com/heroes (click on “Edible Rhody”); you can also get directly to the survey form by clicking here. The deadline for submissions is December 3rd. Thanks in advance for your support! Right now, several SCLT staffers are attending the Community Food Security Coalition’s annual conference in New Orleans, which runs through tomorrow, October 19th. Along with representatives from United Methodist Ministries, SCLT’s community gardens coordinators Liza Sutton and Erika Rumbley were invited to lead a workshop on Sunday entitled “Building Community Food Security through Community Gardens.” Their presentation focused on ways to foster healthy community gardens and promote self-governance among garden leaders. With support from a USDA Community Food Projects grant, education director Leo Pollock, outreach director Jessica Knapp, and development director Susan Sakash were also able to attend the conference. SCLT is pleased to be able to participate in these sorts of gatherings across New England and across the country and share our experience with urban agriculture! Earlier this month, Southside’s executive director, Katherine Brown, was invited to speak as part of the Theological Opportunity Program’s fall 2010 lecture series. The series’ theme was “Change, Power, and Resilience.” In her address, entitled “Confronting the Food Industry: Changes and Choices,” Katherine outlined many of the problems with the mass industrial food system and suggested several avenues for creating a healthy, humanistic alternative that can grow alongside the existing system and perhaps one day, overtake it. She made the case that we must first understand the need to change and then work collaboratively to produce food in sustainable ways, safeguard land from development, share knowledge, and build a local infrastructure from the grassroots up. To read a script of Katherine’s inspirational remarks in PDF form, please click here, and to hear her speak, be sure to tune in to hear the broadcast of last night’s ACTION SPEAKS! panel (see below) on WGBH on Sunday, November 21st at 8:00 p.m. SCLT is proud to have Katherine’s leadership in our efforts to enable more people in Providence to reconnect with the food they eat. SCLT is thrilled to be a part of the upcoming ACTION SPEAKS event at AS220. 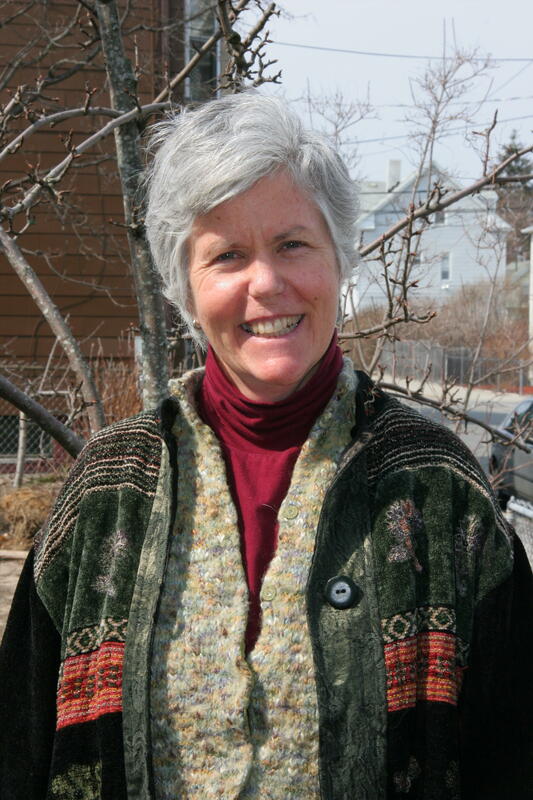 Our Executive Director, Katherine Brown, will be on hand to talk about the local food movement happening right here in Providence. Eat Locally, Think Globally! Chez Panisse and the fresh, local and slooow food revolution! Action Speaks! Underappreciated Dates That Changed America returns to AS220 at 115 Empire Street in downtown Providence for its 15th season! Come to the second show of the season entitled “What’s Eating Us?” on Wednesday, October 13th at 5:30 p.m. at AS220 to look at the famed Berkeley, California restaurant Chez Panisse and its founder Alice Waters, and to wonder at the changes brought forth by a woman who simply wanted to create a place where you could relax while eating well. Join host and creative director Marc Levitt and our panelists, Professor Christine Thompson, associate dean of arts and sciences at Johnson and Wales University; Thomas McNamee, author of Alice Waters and Chez Panisse: The Romantic, Impractical, Often Eccentric, Ultimately Brilliant Making of a Food Revolution; Rolando Robledo, who runs two locavore food carts in Cambridge and Boston and is opening a restaurant in Harvard Square; and Katherine Brown, executive director of the Southside Community Land Trust in Providence, an organization committed to the mission of helping people grow food. Panelists will consider: Is Food Inc. killing our bodies and our souls? Is supporting the planet’s population by “eating local and seasonal” a fantasy? What are the political, social, economic, and health benefits of eating local? Can we envision a world in which we can all afford heirloom tomatoes?